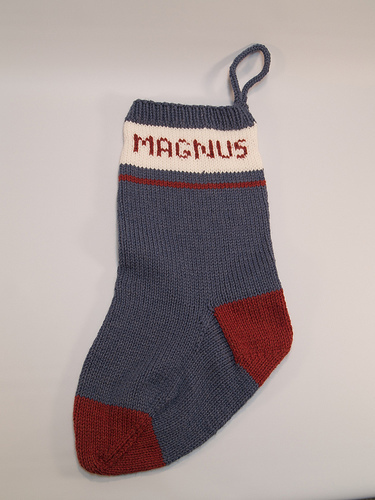 Magnus’s stocking is all done and I’m making a trip to the farm this weekend to make the special delivery. I really wanted to add a personalized tag to the stocking, so that later when my wee nephew is older, he’ll know who made it for him. 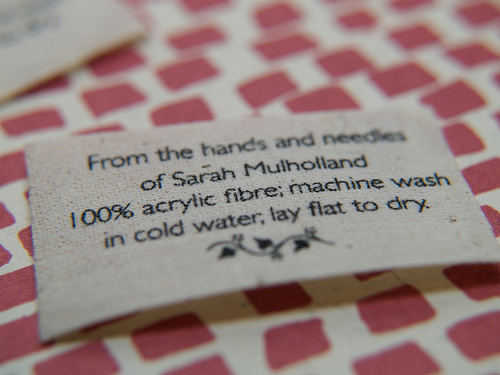 I did a little searching online thinking I’d order something and stumbled across Grumperina’s instructions for making labels out of t-shirt transfer sheets you can print with your bubble jet printer. I’ve used these before but it didn’t cross my mind at all to use them this way. She uses satin ribbon for hers, which I like, but all I had handy was some light cotton, so in a pinch I made that work. The stocking is a bit wider than I’d like but in all I’m very happy with the modifications I made to make his name work. 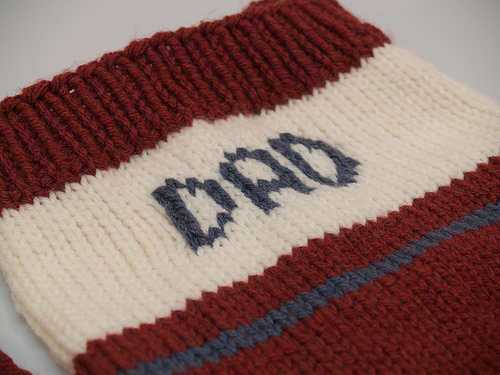 On the other hand, since Christmas is still a few weeks away, I got started right away on the stocking for my brother (aka “Dad” – to Magnus that is), but of course there is a lot more distance between the stitches for the name to be carried across both sides. I tried this, but had some terrible pulling happening and the blue yarn was showing through the front – a shadow of sorts was appearing on the right side. So I ripped it all back and tried a new idea, keeping several yards of yarn going for the blue stitches on either side with a tapestry needle on the end so I could weave it back to the beginning for each row. This was better, but you can still see some squeezing of the stitches happening. But I can live with that. I’m hoping I can finish this one up this weekend while I’m still at the farm, so I can give it to them before I come back to the city.